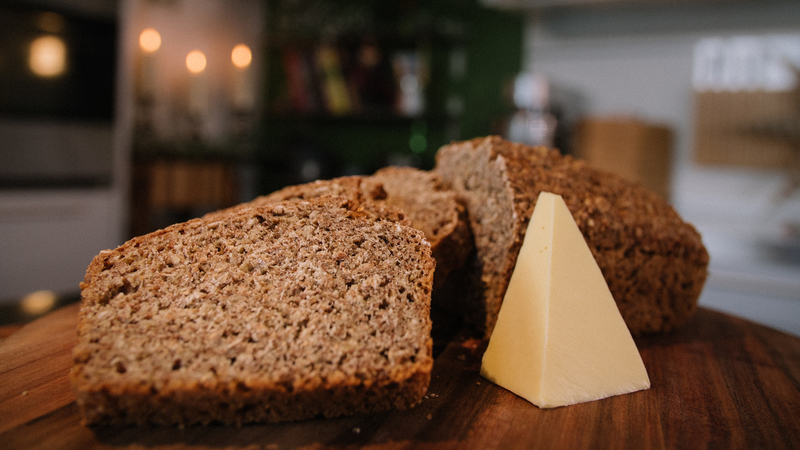 Kevin Dundon's Brown Bread is always a family favourite. 1. Preheat the oven to 150˚C. 2. Place the flour, porridge oats and salt into a large mixing bowl. Sieve in bread soda and combine with the flour mixture. 3. Make a well and add the egg. Slowly pour in the buttermilk and stir to combine to get a ‘sloppy’ consistency. Add one tbsp treacle. 4. Pour into a greased 2lb loaf tin and smooth the top of the bread with a wet spoon. 5. Bake in the oven for 1 hour. 6. After the hour has elapsed remove the bread from the tin and return to the oven to bake for a further 5-10 minutes. 7. Remove from the oven and allow the bread to cool down. 8. This loaf will keep fresh for 4–5 days and is suitable for freezing. Tip: Sprinkle some extra seeds in the baking tin then add the bread mixture. When mixing the bread, stir as little as you can, so the bread stays light and aerated.This bread give better results if made by hands vs bread machine. This recipe makes a 900g (9-inch) loaf. Have made this bread a few times, absolutely beautiful. Love when Kevin taps the end of the bread to check if it cooks, it's what my mother always did. Brings back wonderful memories. Made this recipe recently as it came up on the website, I was not disappointed it turned out beautifully, everyone one loved it, my mother in law who's a great cook wants the recipe.